Partial Letter Written to Unknown Recipient Concerning Sad State of Clarissa Waldo, Date Unknown from the collections of the Worthington Historical Society (WHS) may be used for educational purposes as long as it is not altered in any way and proper credit is given: "Courtesy of the Worthington Historical Society, Worthington, OH." Prior written permission of the WHS is required for any other use of Partial Letter Written to Unknown Recipient Concerning Sad State of Clarissa Waldo, Date Unknown. Contact WHS at info@worthingtonhistory.org to request permission. 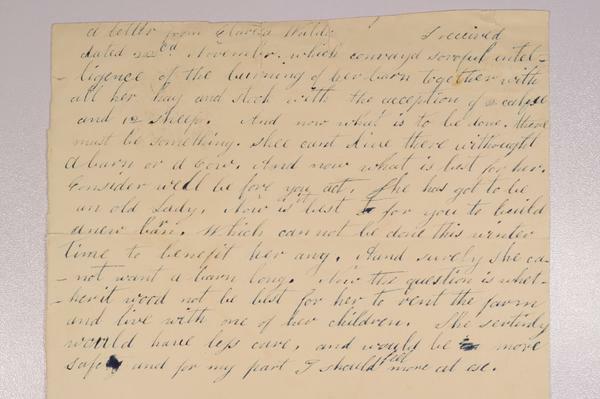 Partial Letter Written to Unknown Recipient Concerning Sad State of Clarissa Waldo, Date Unknown is text, with genre letter and correspondence. Its dimensions are 7 in. x 7.5 in.. It was created around 1840-1870. Worthington Historical Society is the Contributor. Clarissa Waldo (née Johnson), 1798-? is the Associated name. This partial letter is from an unknown writer written to an unknown recipient. It discusses the troubles that have befallen Clarissa Waldo, sister of Orange Johnson, and how she will be able to go on given her age and her circumstances. According to the letter, Clarissa's barn burned to the ground destroying her hay and killing most of her animals. The writer worries that with it being winter, Clarissa will not survive without a barn and animals. Because it would take too long to rebuild the barn in the winter, the writer goes on to suggest that it may be best for Clarissa to rent out her farm and go live with one of her children. It covers the topic history. It features the people Clarissa Waldo (née Johnson), 1798-? and Orange Johnson, 1790-1876. The Worthington Historical Society identification code is 2012.0005.06. The Worthington Memory identification code is whs0994. This metadata record was human prepared by Worthington Libraries on June 12, 2017. It was last updated October 13, 2017.